A recently published study claims that WalMart Pay is getting ready to surpass Apple Pay —but fails to acknowledge the more limited reach that the QR code-based service has versus Apple's. An account published by Bloomberg on Tuesday, citing a digital payment service study, claims that WalMart Pay is "close to surpassing" Apple Pay in usage for mobile payments in the U.S. However, the reasoning is flawed, based on the extremely limited metric that both the publication and study generators Crone Consulting have picked to assess the difference. According to a metric correlating percent of total transactions in stores that accept the payment method, WalMart Pay was sitting at 5.1 percent in June, versus Apple's 5.5 percent —with both growing. WalMart believes that this metric will grant them the crown of digital payments champion. "If daily enrollments don't slow down, I think that's pretty well in the cards shortly," said WalMart's Senior Vice President for Services and Digital Acceleration Daniel Eckert. "I would have to imagine we are getting pretty close." However, the calculated metric means very little. WalMart Pay is accepted in all of the company's 4672 stores. Apple Pay is accepted at millions of locations, spanning dozens of major retail chains like Apple itself, Best Buy, JCPenney, Macy's, Office Depot, Staples, and Urban Outfitters —as well as several fast food chains including McDonalds with over 14,000 restaurants, Chick-fil-a with over 2200 U.S. locations, and over 8000 Starbucks Coffee stores. The data for the Bloomberg story, and WalMart's claim of dominance was collected from a Pymnts survey. 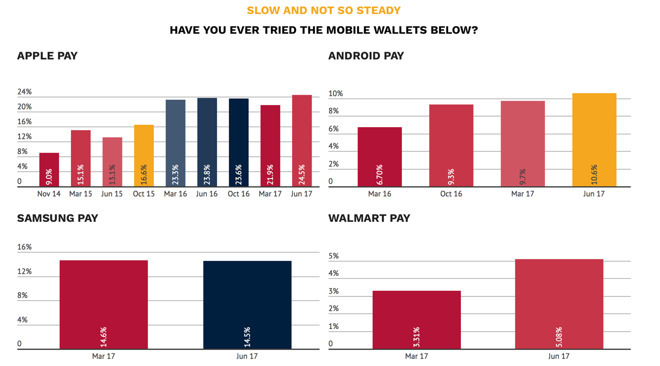 Ignored by both are other metrics about digital payments from the survey, claiming that 24.5 percent of those questioned claimed to have tried Apple Pay, with only 5.08 percent having used WalMart Pay. The difference in survey methodology is noted in the small print at the bottom of the Pymnts survey that WalMart is using to declare impending victory, and aggravated by assorted bar graphs in the study that are the same size, but use different scales. According to the survey data, an "eligible transaction" for Apple Pay means people with an iPhone that shopped at a store that accepts Apple Pay. For WalMart Pay, eligible transactions are only drawn from people that shopped at WalMart. WalMart Pay's technology is roughly based on the failed CurrentC universal digital payment system. There are apps for WalMart Pay on Android and iOS, and the customer must run the app and generate a QR code for the cashier to scan. AppleInsider has used both WalMart Pay and Apple Pay. 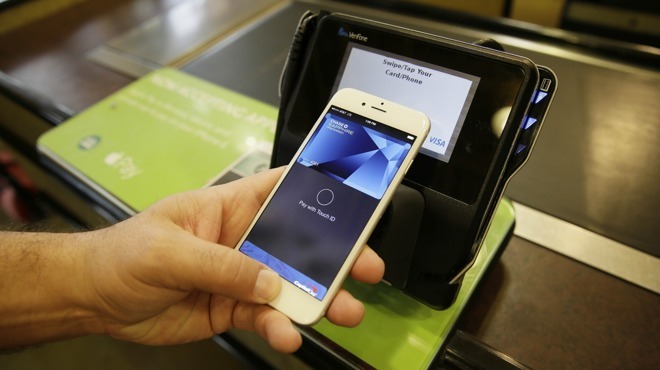 While Apple Pay is not accepted at WalMart, trials have shown the process involving the WalMart Pay process to be a bit longer upon conclusion of scanning the purchased goods versus one with a similar volume at a Wegmans supermarket.